In October 2017, I organized the 200 Stories: Tucson Healthcare Forum. More than 75 people participated in the forum, and most of them shared their stories about health insurance, medical care, drugs, and cost in writing, on video or through the forum survey. The message was clear. People are not ready to give up on the Affordable Care Act. The vast majority (91%) said they are against repeal of the ACA. Two-thirds of the attendees wanted ACA to be fixed (primarily due to cost), and 70% said health insurance should be government-based (Medicare for All). Too many people are still going bankrupt from medical bills because they buy the insurance they can afford–not the insurance they need. The ACA was a good attempt as balanced public policy. It should be amended. One change I would make is negotiation of drug prices. That would save us millions. When asked what adjectives they would use to describe the health insurance system they want, they said they want a system that is universal (91%) and fair/equitable (76%). Any plan that leaves millions of American adults and children without healthcare insurance is not universal, fair or equitable. I agree with them, and that is why I co-sponsored Rep. Kelli Butler’s bill to allow Arizonans to buy into the Arizona Health Care Cost Containment System (AHCCCS or Medicaid). Buying into Medicaid would give people a state-wide public option that is cheaper than what they can buy on the ACA exchange. I think it is a great idea. It’s too bad that party gridlock stopped this great bill from being heard in 2018. LD9 and LD10 Legislators hosted the 200 Stories: Tucson Healthcare Forum. Senator Dave Bradley (not shown), Reps. Kirsten Engel, Pamela Powers Hannley and Randy Friese, and Senator Steve Farley attended. Rep. Todd Clodfelter had a scheduling conflict. In my first term in the Arizona Legislature, I was the ranking Democrat on the House Health Committee and a member of the Banking and Insurance Committee. As a result, I have spent many hours reading, debating on and voting on bills that are related to public health, healthcare delivery, behavioral health, child safety and welfare, drugs, drug addiction, health insurance, insurance contracts, workers’ compensation, defined benefits, presumptive work-related medical conditions, changes in nursing, pharmacy and dental practice and much, more. The Arizona House Health Committee is pictured above, after we passed the opioid bill. Serving on the Health Committee and in the Arizona Legislature has been an interesting journey and one for which I am well qualified. I have a Masters in Public Health from the University of Arizona and decades of work experience in healthcare, public health, medical communications, and research. Most recently, I was the managing editor of the American Journal of Medicine. There were two big wins for public health in 2018– the passage of the comprehensive opioid bill and the passage of dental therapy. My seatmate, Dr. Randall Friese, and I are the only two medical people in the Arizona Legislature. We both played an integral role in the negotiation and passage of the Arizona Opioid Epidemic Act (SB1001/HB2001) in 2018. Unlike much of what we do in the Arizona Legislature, the opioid bill was a truly bipartisan effort. The governor even gave the Democrats the bill language in advance and asked for our input. The Republicans included us in the bill development process because they needed our votes and because didn’t want us to blow it up on the floor with our debate skills. As someone who worked in public health and nicotine addiction treatment for years, I was proud to serve on the Democratic Caucus team that reviewed the bill and offered suggestions for revision. It was very heartening that they included several Democratic ideas in this bill. Four of my suggestions were included: offering treatment instead of jail during an overdose situation, AKA the 911 Good Samaritan bill (HB2101), which has been proposed by Democrats for four years in a row; providing funds to counties for life-saving NARCAN kits (HB2201); providing a non-commercial treatment referral service; and offering treatment in a brief intervention after an overdose scare (when your doctor says, “You didn’t die this time. Maybe you should quit!”). The Democrats also suggested including the Angel Initiative (where addicts can drop off their drugs and ask for treatment, without fear of arrest) and $10 million for drug addiction treatment services for people not on AHCCCS (Medicaid) or private insurance. 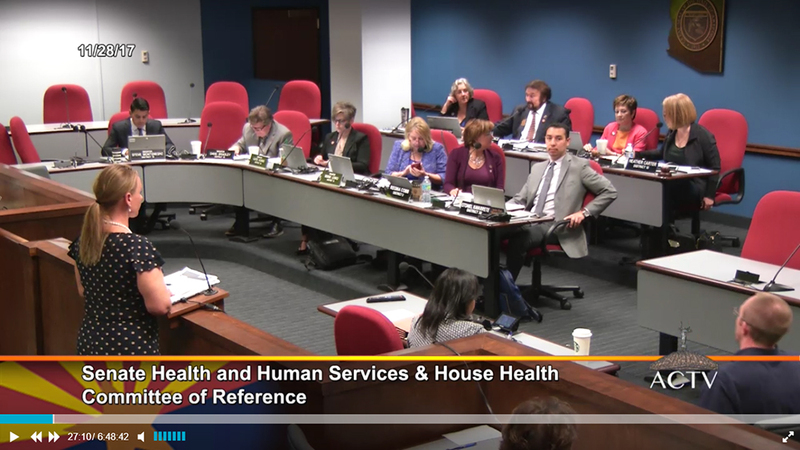 The Sunrise Committee consisted of members of both the House and Senate Health Committees: first row from left, Senators Steve Montenegro, Dave Bradley, Katie Hobbs, and Debbie Lesko and Reps. Regina Cobb and Tony Navarrete. In the back row are Reps. Pam Powers Hannley and Jay Lawrence, Senator Nancy Barto, and Rep. Heather Carter. The passage of dental therapy was a hard fought battle. Going into the Sunrise Hearing in November 2017 (pictured here), only Republican Senator Nancy Barto and myself being solidly in favor of dental therapy, and Navarrete was leaning support. I fought hard for the passage of dental therapy because it expands access to affordable dental care and screening and helps prevent tooth loss. Senator Barto likes dental therapy’s potential cost savings to the state’s Medicaid program. After five solid hours of testimony in the Sunrise Committee, dental therapy passed on a 5-4-1 vote with three Democrats (Bradley, Navarrete and Powers Hannley) and two Republicans (Barto and Montenegro) voting yes. (It is not often that four powerful Republicans are on the losing side of anything in the Arizona Legislature.) Dental therapy was killed in the House Health Committee but– after further negotiations and modifications– rose from the dead as a striker on the last day of the 53rd Legislative Session. Dental therapy will improve access to affordable dentistry for people living in urban and rural areas and on tribal lands. I am proud to have played an integral role in the passage of both of these landmark bipartisan health efforts. I hope we can work together to pass future legislation that can help a broad range of people. Here are a few related blog links. Here are a few of health-related one-minute updates from my office at the Capitol.